Services - Y.C. Chau & Sons Piano Inc.
Our qualified tuners tune all our pianos and are authorized tuners for various fine institutions such as York University’s Dept of Music, Toronto District School Board , Dufferin Peel District Catholic School Board, Four Seasons Hotel and many other prestigious establishments. Our movers are professional and courteous people who take extra care insuring that the piano is in good hands. We specialize in moving your piano in various situations like narrow spaces or stair wells with a sharp turn or difficult conditions requiring us to fully dismantle the piano and re-assemble it , or special treatments with a hoist… etc. Our factory trained technicians are some of the finest technicians with knowledge in rebuilding and restoring the piano to perfection. Our technicians will repair the cracks in the soundboard, install a new pinblock, install a new set of tuning pins, bass strings, hammers and dampers , repair the lyre assembly and custom make piano parts if necessary for vintage pianos. We provide refinishing services to those that wish to have the cabinet of their piano restored to its original finish or give your piano a fresh new look. We offer a large selection of quality pianos from small console to concert grand pianos for rental to suit your special occasion; weddings, concerts, movie filming and others. With our Rent-To-Own program, you can begin to experience the wonderful benefits of piano ownership for as little as $50 per month. We offer up to 6 months of your rental fees back towards the purchase of any piano in our showroom. 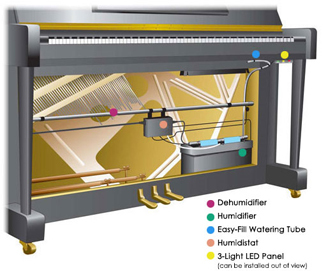 Our technicians are certified to install and fix Piano Disc systems for those who love the classic feel and touch of a piano but also love the wonderful world of technology. Piano Disc systems are able to give a great new way to play the piano. 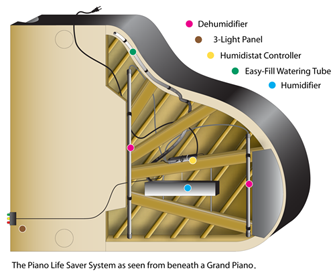 The Piano Life Saver Systems help you maintain and protect your investment by keeping a consistent climate controlled enviroment during all 4 seasons of the year.